15 1/4 X 12 1/8 inches, 38.8 X 30.7 cm. This drawing lies on the boundary between a portrait and an imaginative work, a type of image which the Pre-Raphaelites and their circle made distinctively their own. 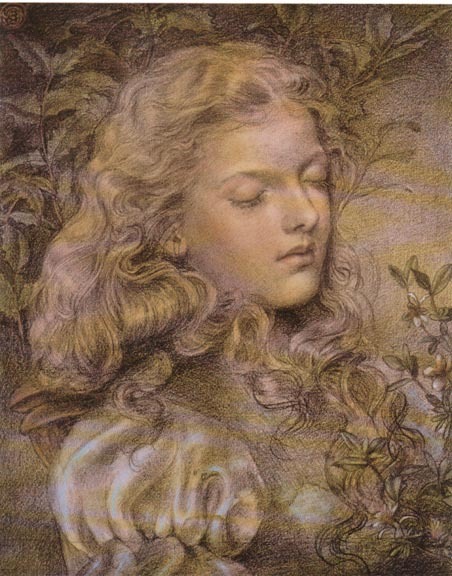 Also Pre-Raphaelite, or rather Rossettian, is the fascination with flowing hair. This image, with the sitter's enigmatic closed eyes, remains difficult to interpret. The holly, however, signifies foresight in the language offlowers. Perhaps if the other plant could be identified more light would be shed on the meaning of the work. [Morgan and Nahum, 137]. Emma Sandys was the sister of Frederick Sandys, and like him produced bust length portraits of women in an intense and detailed Pre-Raphaelite style. Little is known of her life, despite extensive recent research. Like her brother she was born in Norwich and lived there until 1874 when she moved to London. She exhibited in Norwich and at the Royal Academy, where she showed three female portraits, an 'Enid' and an 'Undine' between 1868 and 1874. It is difficult to reconstruct her oeuvre as her paintings are technically very similar to those ofher brother and until recently have been confused with his. Marsh, Jan, and Pamela Gerrish Nunn. Pre-Raphaelite Women Artists. London: Thames and Hudson, 1998. 119-22. Morgan, Hilary, and Peter Nahum. Burne-Jones, the Pre-Raphaelites, and Their Century. London: Peter Nahum, 1989. Catologue number 138.